Hard Spun's four-year-old colt, Vegas No Show, put a head in front of the pacesetter at the top of the stretch of the Ricci Tavi Stakes at Delaware Park, after racing in third for most of the one mile and 70 yard event, and it was just about that same margin at the wire as the four-year-old fought courageously down the lane to notch his second career Stakes win. Vegas No Show, bred by Stonestreet Thoroughbred Holdings, LLC, in Kentucky, is a half-brother to G1 Whitney winer Bullsbay, to G3 winner Our Khrysty and to Listed winner Hidden Expression. He is out of the multiple Stakes-placed mare The Hess Express. In addition to Vegas No Show, Hard Spun has sired 21 additional Stakes horses in 2013, including Europes top-weighted three-year-old sprinter, Moviesta, impressive winner of the five-furlong, G2 King George Stakes. 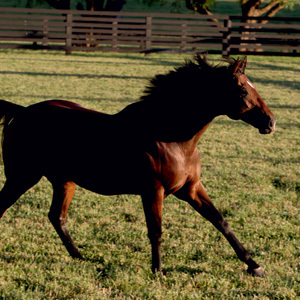 From three crops to race, he has sired a total of 20 Stakes winners and 20 Graded or Group performers. Included among this group is Eclipse Champion three-year-old filly Questing as well as G1 winner Zo Impressive.